We had our doubts about the new skate park on the south end of Grant Park, but in our opinion it's been a nice and unique addition to the neighborhood. We've had a couple fun walks where we've stopped at the park and spent time admiring the skills that these kids (and some adults) showcase. 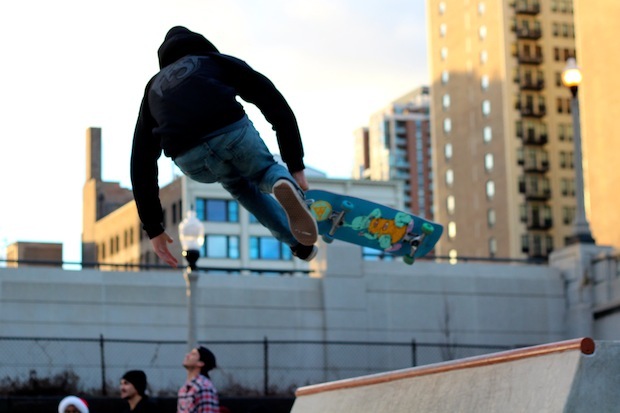 The Dew Tour, a nationally televised skate and BMX biking competition, is set to kick off its 2015 season June 20-21 at the new $2.7-million Grant Park Skate Park, said Bob O'Neill, president of the Grant Park Conservancy. The tour, which will be broadcast on NBC, would be the first major event for the skate park since it opened in December. Even if this might not be your cup of tea, it's another event that brings more people to the neighborhood and ultimately supports our local businesses. It will also probably be a nice way to showcase our beautiful city and skyline to a national audience. Anyway, looking forward to seeing this event and some of the craziness that the "pros" will bring to this new park.